Rainbows were everywhere in the 80s – on our shirts, sweaters, stickers, earrings, on the backs of our satin jackets, in our hair on our barrettes, and emblazoned across our Trapper Keepers. 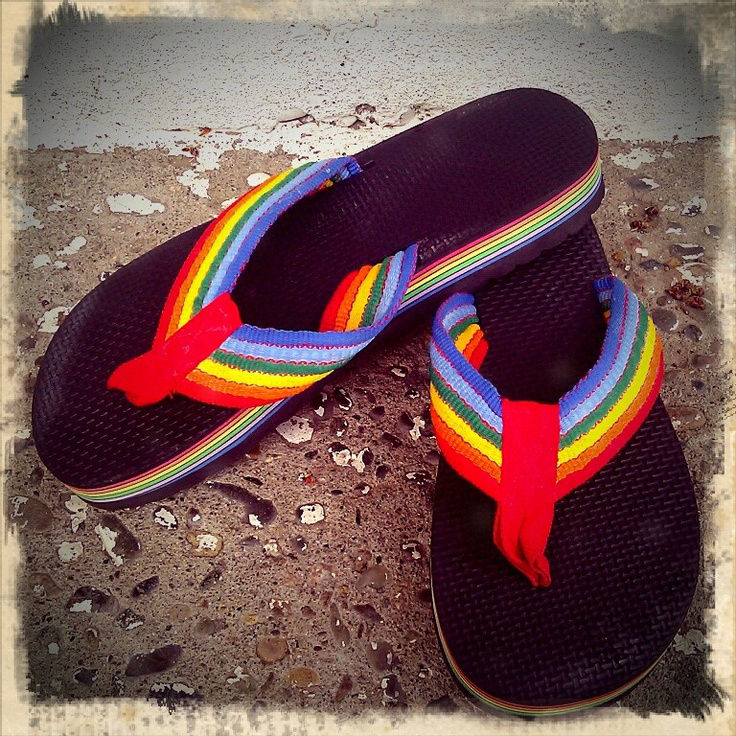 And, in the summertime, the beauty of the rainbow shimmied down to our feet as we all walked around in these: Ah, the flip flop – the essential summer shoe staple. I had a pair with a giant plastic sunflower on them that were rather painful, with all that pointy petal-plastic going on. 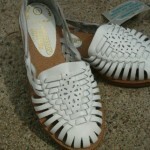 But my favorite summer shoes were a pair like these – comfy, soft, fabric rainbow jobbies. Flip flops weren’t just for the beach in the summertime; oh no, no, no . . . they were built for bike riding, going to the pool, summer camp, running through sprinklers, going on vacation, tree climbing, and just going up the deli to get a Slush Puppie or ICEE with your friends. Having all the colors of the rainbow, they went with absolutely everything—how perfect! 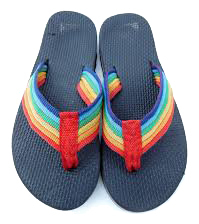 This classic style flip flop usually had a double rainbow going on: one on the straps, and one on the sides of the shoe, with stacked up colors against a thick black, cushy background. 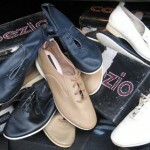 Unlike other rainbow-themed items, these colorful shoes were not just for the ladies – guys rocked the look as well. Paired with some corduroy OP board shorts or a sweet pair of Jams, the boys in my 8th grade class were lookin’ pretty rad wearing rainbows on their feet. Who also remembers the flip flop key chains that were oh so popular? 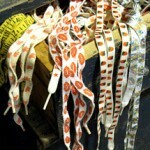 Lots of kids would fasten them to their book bags or the girls would put them on the zippers of their purses. If it happened to be a rainbow flip flop keychain, it was all the more rad. 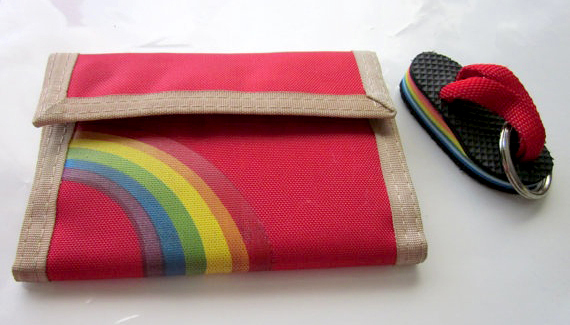 Paired with a Velcro rainbow wallet? Complete awesomeness. These vintage summer shoes (that make the best sound in the world when you walk) are still available all over the place – on etsy, amazon, or your local vintage or surf shop. However, they can be a little hard to find when searching because the brand name “Rainbow” flip flops muddies the search results. Here is one pair we found on Amazon (although, while the sides are right, they are missing the rainbow straps). Even if, at the end of the day as you kick them off, you notice that annoying pain between your first and second toes you still smile. Why? Because it feels like summer. 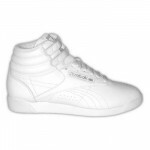 Let me know if you know if and where they still sell these. I have been looking for a long time. I have the little flip-flop keychain–only it’s blue. If I am not mistaken, that was the 70s, not the 80s. I think it was a trend that straddled the late 70s and early 80s, but all the teens of the 80s were kids of the 70s! dont forget about whale-patterned turtlenecks & sweaters, duck shoes, lacoste shirts, oxford blouses with diamond pattern sweater vests and skinny ties (girls too!) 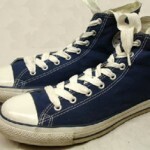 and jeans for poor girls (Chic and Gitano) who couldnt afford Guess, etc. how bout the “prairie look” from about 1982? u make me wanna feather back my hair and talk “valley girl.”!!!! 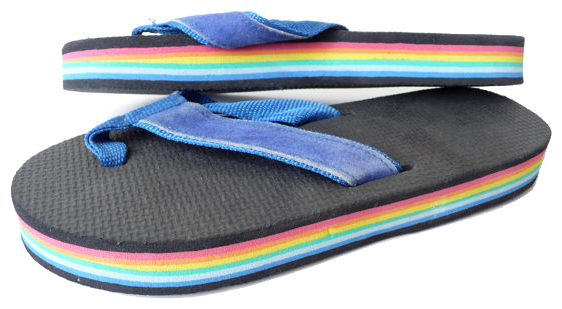 Bought a pair of rainbow flip flops in 1983. I had them resoled a couple years ago. I was on vacation this summer and one was lost. I would like to get the same style . I can send you a picture of the lonely flip flop. Whoa. I had the flip flops AND the wallet AND the little flip flop keychain! Mine was blue. I remember wearing these flip flops. some were rainbow colors and there were also blue one and brown and orange ones. the think i remember i didn’t like about the flip flops was that the foam wore out easily and little threads of foam would peel off.